“Bad Egg” alludes to the disappointment felt when cracking or shelling an egg, only to find that it’s bad. Although the earliest estimated use of the term dates back to 1856, I have known a few “bad eggs”, but not from White Oak Pastures! 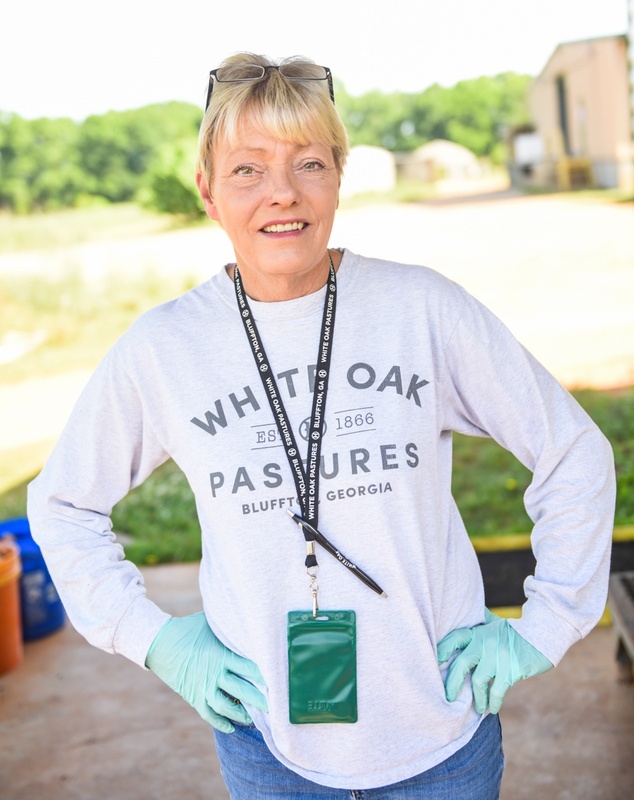 Under the supervision of Evelyn Taylor, White Oak Pastures egg team provides our customers with the freshest, healthiest, most wholesome eggs on the market. 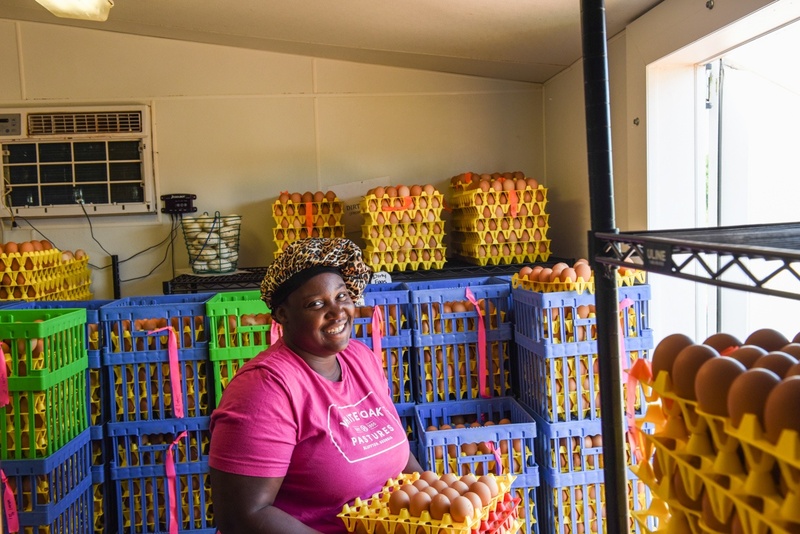 The following is just an inkling of what it takes to process our farm-fresh eggs, which are in such demand! 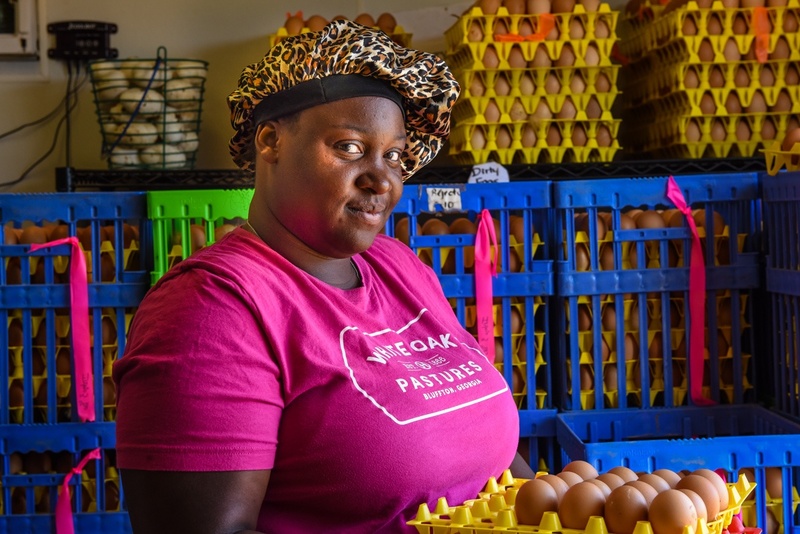 When White Oak Pastures introduced hens to our now multi-species farm, we didn’t realize the benefits we would reap from what came with the hens….their eggs! 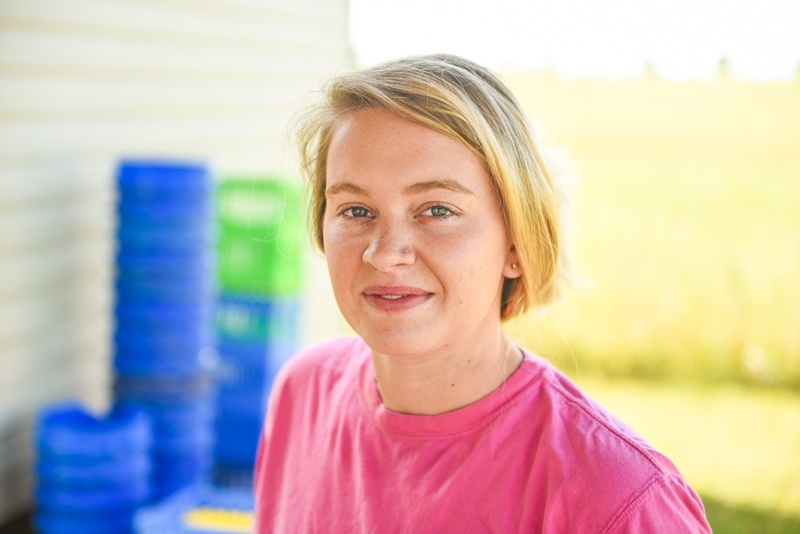 From the beginning, we had very strict safeguards to make sure our hens were healthy and this continued until we decided to include eggs as a part of our product line. Our pasture-raised hens are outside and unconfined 365 days a year and roam wherever they like. Their nutrients come from foraging bugs and grubs in the pasture, and we supplement with a non-GMO grain mix to enable them to thrive. 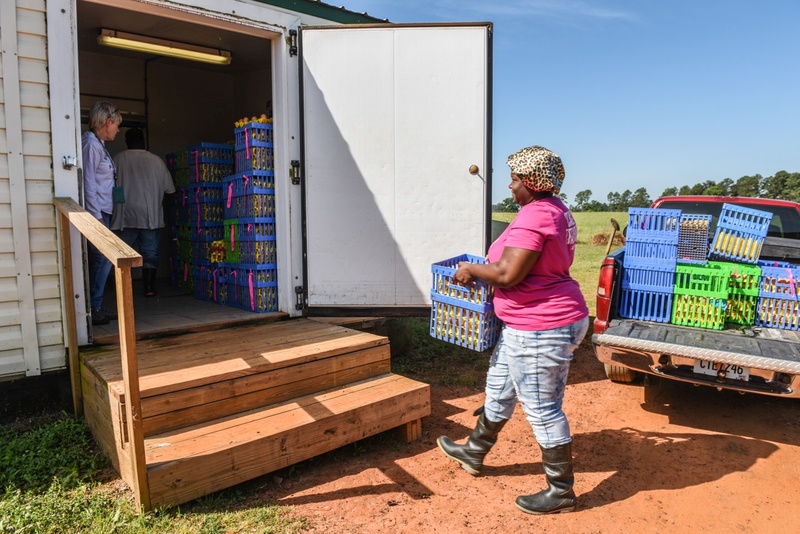 Proper light, shelter, diet, and health are crucial to the production process in order to provide high-quality eggs, and we progressed until we accomplished this. 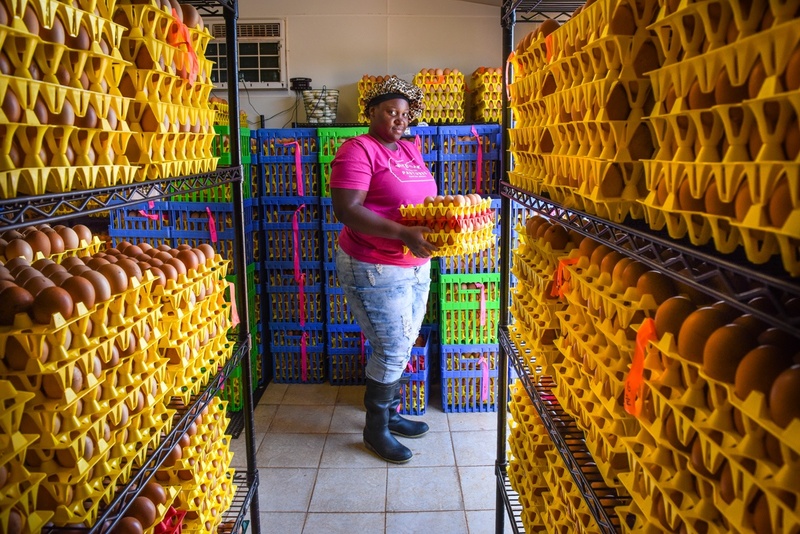 The egg process is initiated after the hens freely lay the eggs in the covey holes built in refurbished farm equipment. 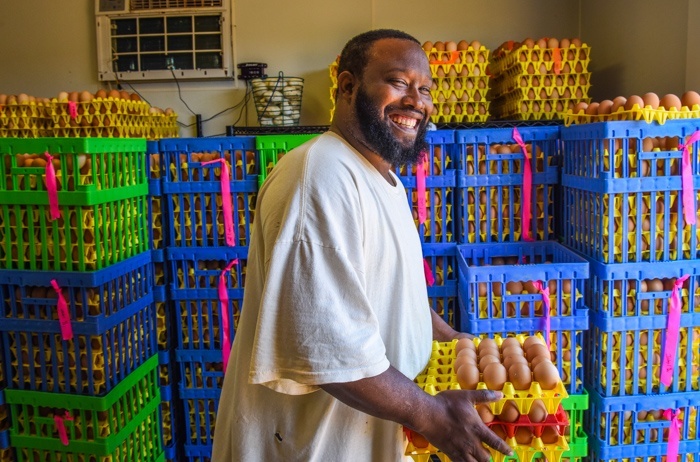 The eggs are collected by Shalanda Williams and Eric Tolbert, who delicately gather our eggs by hand, as opposed to the automated gathering belts used by most production facilities. This is very time consuming, considering we gather approximately 3000 eggs per day. As the hens lay the eggs, they coat them with a natural substance called the “bloom” to protect the porous shell from absorbing bacteria. This explains why eggs that are not washed can be stored on a countertop safely for up to 45 days, maybe longer. 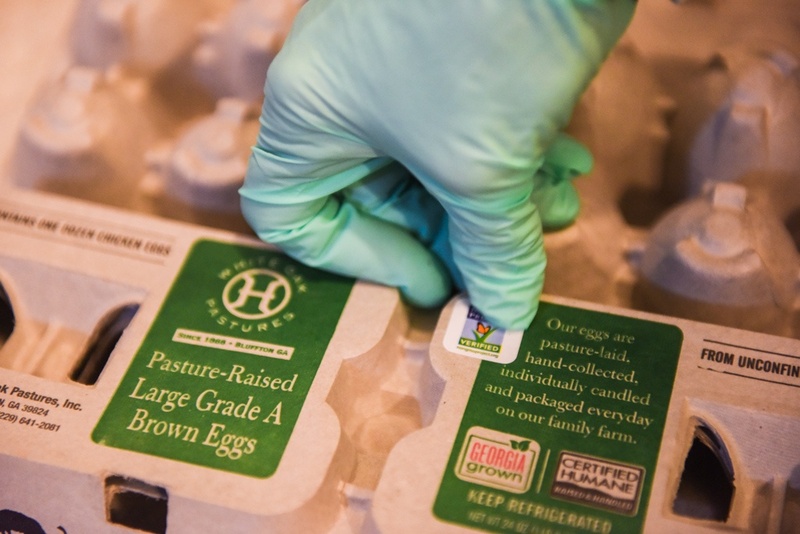 Our eggs are processed one case at a time, which is fifteen dozen eggs. We start by candling each egg. The process itself is named such because the original sources of light used came from candles. It can be compared to a person having an x-ray. In the state of Georgia, you must be licensed in order to candle eggs. 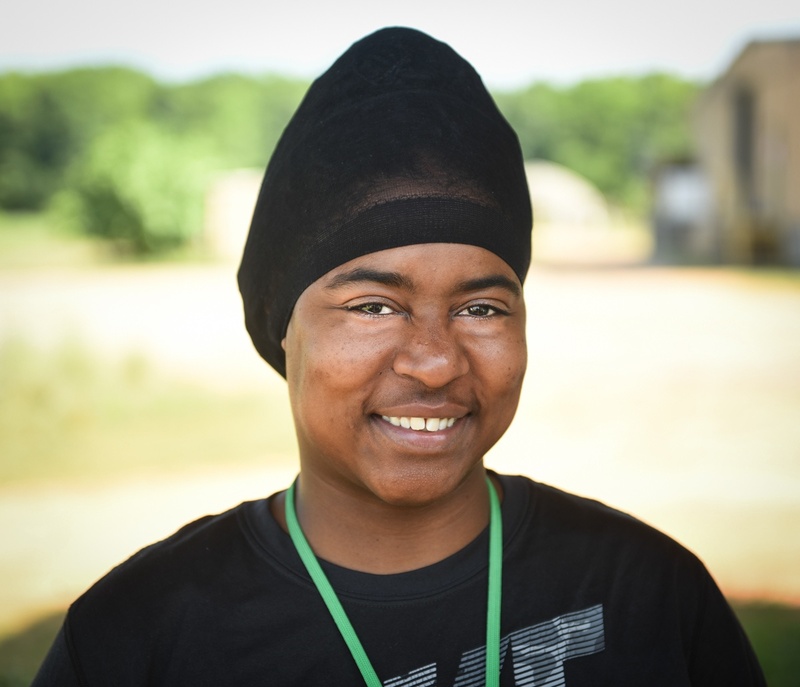 Our lead candler, Evelyn Taylor, received her certification in 2016 from the Georgia Department of Agriculture. 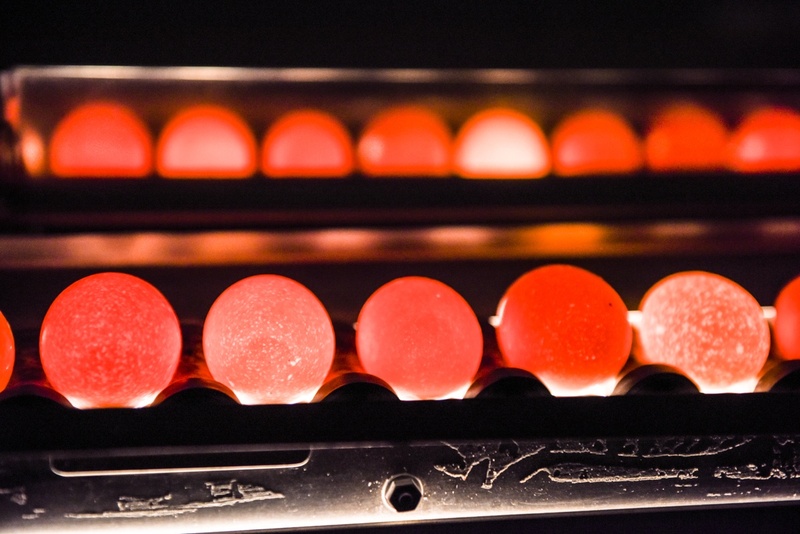 Candling consists of carefully placing the eggs on a mini conveyor belt that rolls them in front of a light to detect anything alarming. 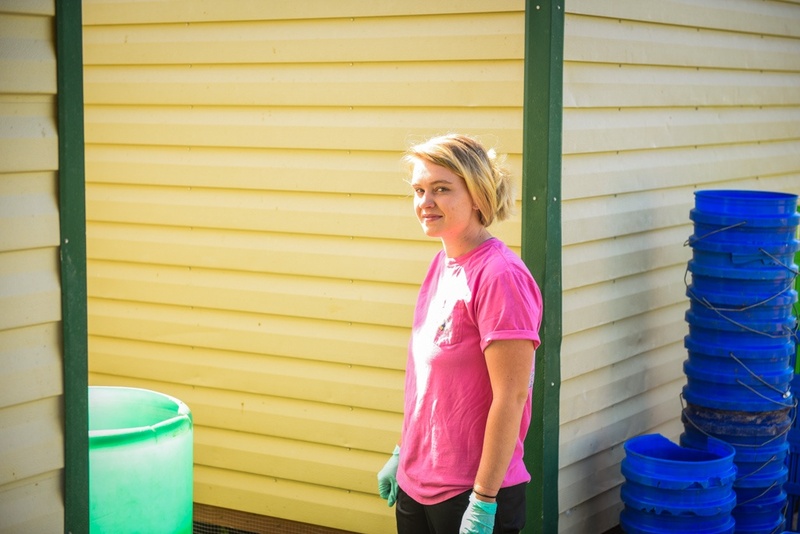 The light allows Evelyn to see through the egg shell so that she can remove any eggs that are rotten or fertilized, or those that may have a loose yolk or a meat or blood spot. She also inspects the albumen and the air cell. If the egg does not meet the specified requirements, it is considered a “reject”, or a “bad egg”. 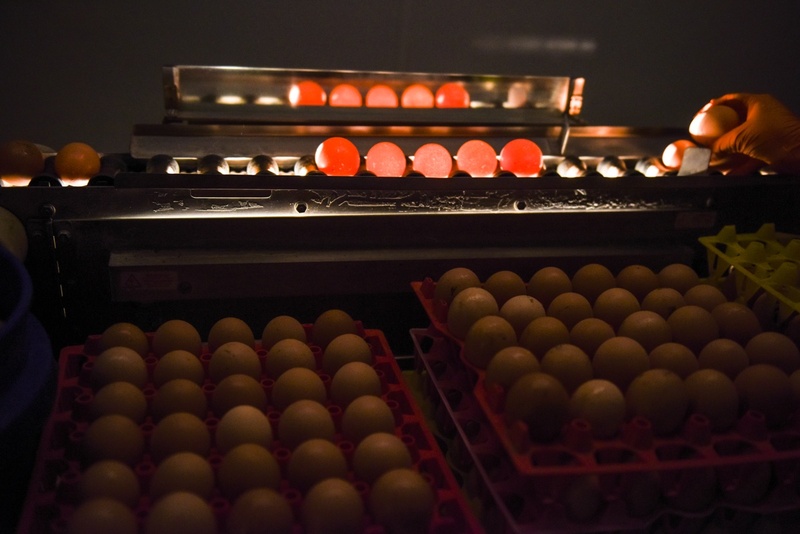 After the candling, the eggs continue on the mini belt where they are mechanically washed. 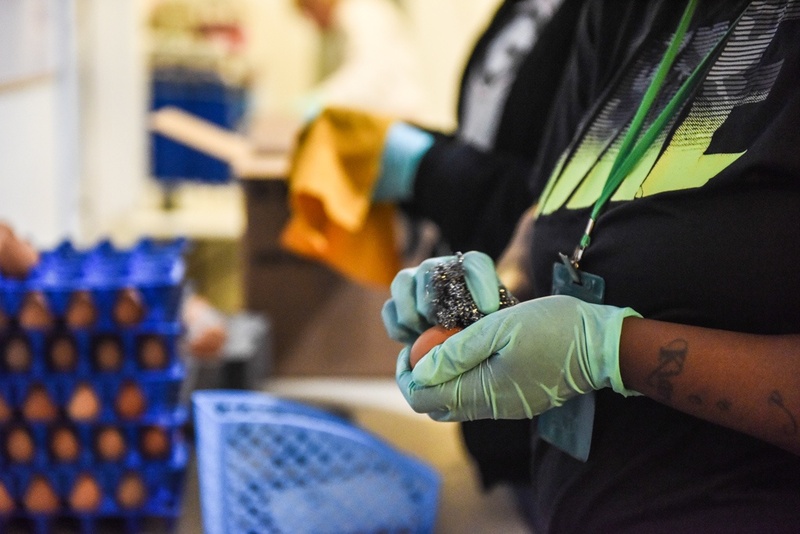 A specialized soap is used while soft-bristled brushes spin quickly around the eggs to ensure they are clean. At this point, the bloom is removed before they pass on through the dryer. Eggs have anywhere from seven to ten thousand pores in the shell, and after being washed, the pores are opened. They must be dried to prevent bacteria from entering the pores. The eggs are electronically weighed and divided into small, large, and jumbo sizes. There is a fourth category of eggs that consist of eggs too small or too large to fit into the small, large, or jumbo category. These “rejects” are fed to our hogs which is congruent with our “no waste” tenet. 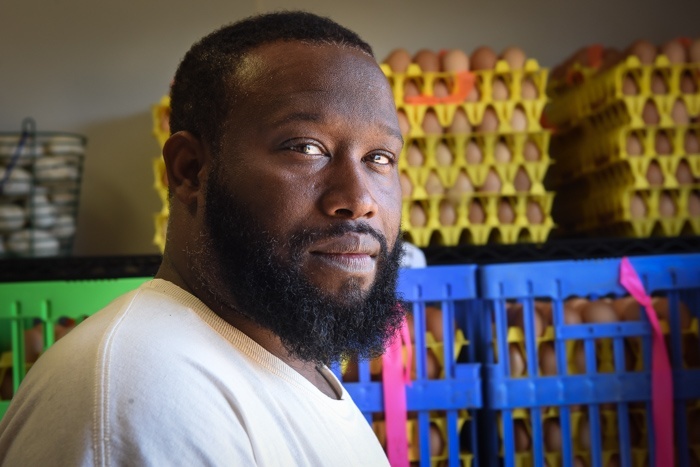 The categorically divided eggs will be refrigerated and shipped to restaurants, wholesale companies, and to our General Store. The unwashed eggs are able to resist bacteria and contaminants because they still have the protective coating. These eggs can remain room temperature and are fresh for up to forty-five days. So whether you come visit us on the farm, which we would love, or order from our online store, we know that we are providing you with the tastiest eggs available.